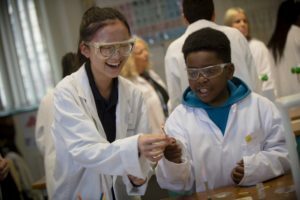 On Sunday 29th April The King’s School invited over 60 children, parents and carers to take part in science experiments together in their annual Family Science Day aimed at raising aspiration in science. The event has grown out of the King’s School’s successful series of science masterclasses called “Saturday Smarties” – now in its fifth year. The Year 5 and 6 children came from local primary schools with transport provided if needed and a crèche for younger siblings. After a morning of fun and exciting science, a delicious Sunday lunch was shared by all our guests and volunteers. Certificates were presented by Rosie Duffield MP and The Lord Mayor, Councillor Rosemary Doyle. The ten- and eleven-year-old pupils were amazed as they explored a feast of different activities, learning alongside their parents and carers for the day. Physics, biology, and chemistry teachers guided the participants as they lit Bunsen burners and explored different coloured flames, investigated wriggling water fleas under the microscope and even made their own pinhole camera to take home. They loved putting on their lab coats and goggles to become scientists for the day, a taste of things to come before the children move onto secondary school. Many parents commented on how enjoyable it was to spend quality time with their child, learning science together. Research has shown that for this age group it is crucial to have support from home in encouraging children with STEM subjects. Our King’s School volunteers also really enjoyed their day with one saying that “sacrificing my Sunday in exchange for the intrigued faces I saw in the science labs was very rewarding.”. 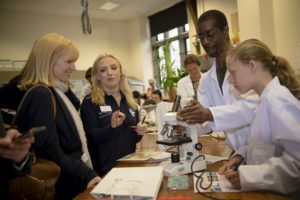 We are already planning our next Family Science Day and looking forward to inviting more exciting young scientists and their parents and carers to another day of fun in 2019.